The Giant 60" Churchill planter is perfect for herb or vegetable gardening & is far more attractive than mundane raised bed planters. Or it can be used as a deck box to grow small trees or shrubs. 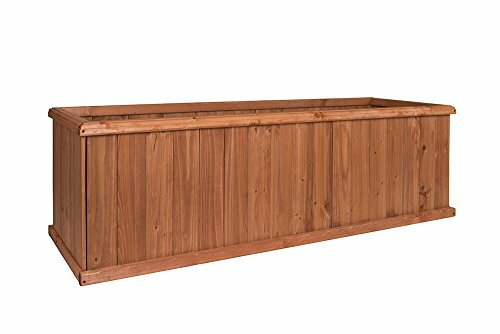 The cedar wood components are pre-stained with an environmentally safe water based stain to ensure lasting service. The wood comes from responsibly managed forests-no old growth wood is used. The convenient piece O' Cake design includes foolproof corner alignment, pre-drilled holes, & 16 wood screws. Assembly can be completed in about 10 Min using only a screwdriver. The result is sturdy construction, which will make our planter last longer than those using Staples. 60" x 18.7" x 18.7"
If you have any questions about this product by Greenstone, contact us by completing and submitting the form below. If you are looking for a specif part number, please include it with your message.